Should you need to delete a fixture, if for instance it is duplicated or has been uploaded in error, follow these steps. Step 2. 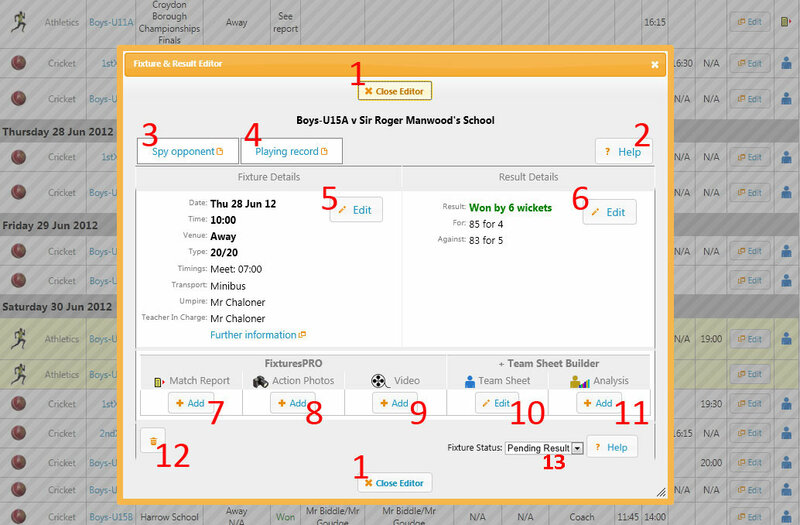 Navigate to the sport, team and fixture list that contains the fixture to be deleted. Step 3. Click the Fixture & Result editor button of the fixture to be deleted. Step 4. Click the fixture delete button - this is button 12 in the screen shot below. Competition fixtures associated with a Competition Microsite cannot be deleted. If a fixture has been postponed or cancelled and you do not want to delete it, then by setting the Fixture Status to postponed or cancelled it will remain in the listings. The Fixture Status (13 in the screen shot) only appears for fixtures in the future that are due to be played.